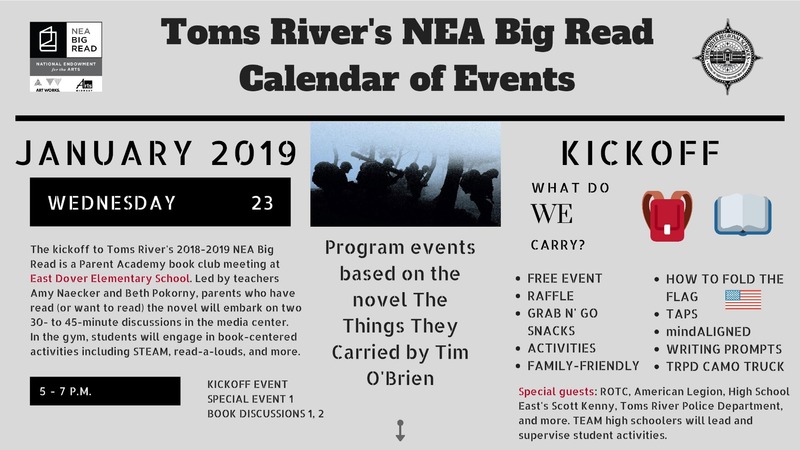 Themed What Do WE Carry?, Toms River's 2019 NEA Big Read Kickoff Event will feature book discussions for parents who've read this year's selection-- The Things They Carried by Tim O'Brien-- and fun activities for children. Jan. 14, 2019-- Toms River’s 2018-2019 NEA Big Read program will kick off next week with a free event at East Dover Elementary School. 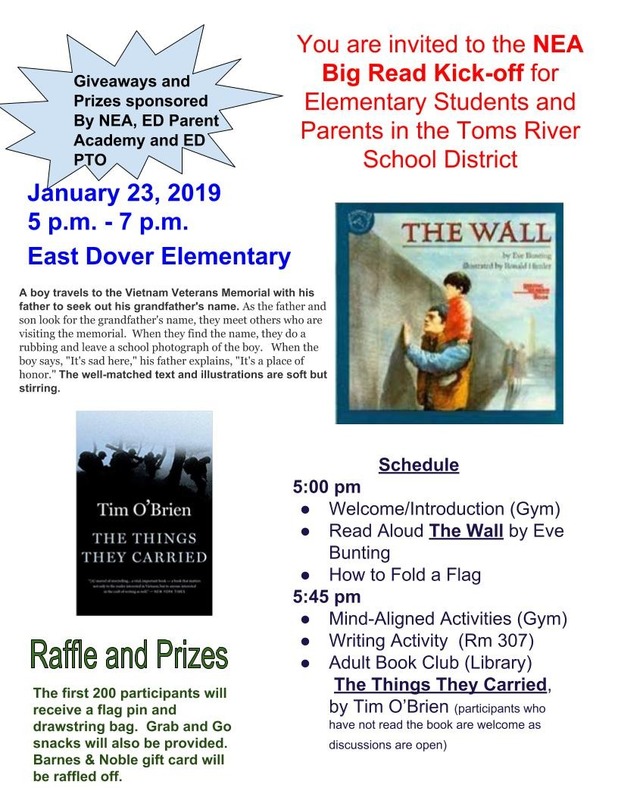 The first in this year's robust timeline of events, the Kickoff will take place 5-7 p.m. Jan. 23 at East Dover, and will include a variety of adult- and student-centered activities. NEA Big Read 2019 is based on the book The Things They Carried by Tim O’Brien, and the Kickoff Event will host book discussions for parents who have read, are reading, or who are interested in reading the award-winning Vietnam War-based novel. Interested parents with K-5 students (and younger) need not fret about childcare, as the gymnasium will be the site for many fun activities for kids. A read-a-loud of The Wall by Eve Bunting-- a K-5 companion book of The Things They Carried which is about the Vietnam Memorial Wall-- will give way to the creation of a wall dedicated to lost loved ones. Scott Kenny from High School East will teach students how to properly fold the American flag. Additionally, high school T.E.A.M. volunteers will be on hand to supervise and watch little ones. The free event will also feature a raffle, snacks, prizes, and more. The first 25 parents to register will receive a free copy of the The Things They Carried, and a handful of books still remain to be given away. Interested parents can RSVP to JoAnn Nocera at jnocera@trschools.com or 732-505-5840.